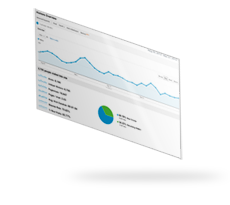 ACI can provide log analysis and website usage feedback with AWstats and Google Analytics. Both AWstats and Google Analytics provide online reports with both raw numbers and visual representation of data collected. ACI can set up these tools and train you on their use. Or ACI can do the analysis for you and provide monthly reports.